It's not the witches or warlocks, the skeletons or the Palin effigies that frighten me most, it's the idea of serving myself up on a silver platter to the Pharma-Gods in order to experiment with my body in the name of science or at least in the name of future profits. Granted, looking back on this past year, things have gone exceptionally well for me, but I had no clue it was going to be like this. I had that one big scare several months ago when two people had serious adverse events from Fingolimod (the one in the coma with viral meningitis and the other who died from Chicken Pox). Then I immediately had a flare up of HSV as if to test the theory of whether or not I, too, would be adversely affected if the virus was active. As a bonus fright, I was examined by my GYN and told I had a cyst on my right ovary that needed to be checked out. Being a lab rat is not without terror. From reading over the informed consent where they present all the possible scenarios of worst case side effects, to undergoing strange tests and never knowing the results, for someone like me who is a big sissy and an even bigger hypochondriac, it's been a scary ride. Even after surviving a year of the study and experiencing amazing results that I never even dared to hope for, I still had a chill come over me the day they handed me the updated consent to sign (reflecting the two serious *Adverse Events*) in order to get into the Extension Phase, along with my ID card I now carry. The ID card identifies me as a clinical trial patient and explains it a little bit, then gives all the contact info for the Clinical Trial coordinator, the neuro, and the Research Department in general...just in case. "JUST IN CASE WHAT??!" my brain screamed as I envisioned myself being wheeled into an ER from a serious accident of some sort that requires them to cut my clothes off me while I can't speak, and they see my legs are hairy (because who ever sees them, so why bother) and my undies aren't as fresh as they should be (since I apparently just got the crap scared out of me in a serious accident). Heck, those things are scary enough, but to think somehow the reason for my visit might be BECAUSE of the Fingolimod and I might be unable to go into a long winded explanation of my situation...well that's all new fodder for the Worry Machine that is my brain. All this sort of explained to me, in a light bulb, "aha" moment, the reason we clinical trial patients seem to have an unnatural attachment to our Trial Coordinators. It was brought up in a recent post on the secret (well I blew that, didn't I?!) Yahoo Group for us fingo heads. It's a private group where all us lab rats ingesting chinese fungus gather to share our stories and compare notes. (If you are a Fingo Head and want to join, sign up at: http://health.groups.yahoo.com/group/fty720/). Anyhow, someone mentioned that their Trial Coordinator left and they were feeling uneasy transitioning to the new one since they'd gotten so attached to their old one. Having been through this very scenario myself early on in my trial, I could relate to the anxiety level the poster was feeling. I am attached to my group at the research department as well. Heck, that could be a big factor in why I signed on for the Extension Phase. They're just about the only group of real life acquaintances that I see on any sort of regular basis since I finally stopped walking my 10-year-old to class and chatting with all the school employees daily (my mother said I had to "cut the cord"). I have my Study Nurse on speed dial and she thought that was funny when I told her. What? Did she think an admitted hypochondriac who resides 2 hours from the study center would settle for anything less? I'd prefer they moved the study center next door to me and have all the staff reside on premises, but since that's not gonna happen, I have her on speed dial. As we head off into this Halloween night, I'll be taking my little Count Dracula door to door to get his fair share of goodies. I'll also be practicing "Spread the Wealth" when we get home as I tax his bucket for chocolate. I wanted to dress up, too, but I guess the costume I was looking for was just too scary to even comprehend. I wanted a human-sized exercise wheel so I could go as a Lab Rat. Muahahahahahahaha. Another first for me since the dawn of my MS. I spent Friday night sleeping in the woods. 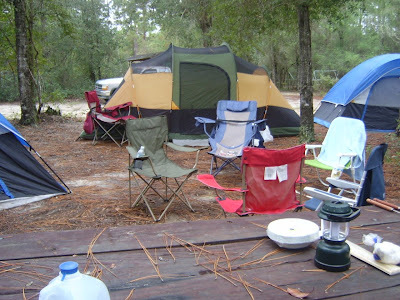 My 10-year-old son, Alix, is a Cub Scout and we went on a Cub-o-ree camp out this weekend at Camp Shands in the NE Florida wilderness. I have been fretting about this trip for weeks. Ever since I committed us to go. I knew Alix was psyched up for it, so there wasn't any option of saying "Mommy doesn't feel like it," although the closer the day got, the less I really wanted to do this. My older son, Mark, (26) said he'd go along, too, and he borrowed this tent (center) from a friend. I'm glad he's got such nice friends with good taste in tents. I packed every conceivable thing I thought I might need in the middle of the woods...except for a flash light. I remembered that when it got dark and I was trying to navigate through the underbrush to the bathroom facilities. The truck in that pic was just offloading supplies. We were actually made to park in the parking area which was about 1/4 mile away down a soft sand road. I can't tell you how many times I had to go back to the jeep for just one more thing I had forgotten to get out of it. Each time I made the trip, I returned to camp exhausted and ecstatic that I had managed to survive without collapsing in the bushes on the way back. I collapsed in the tent on the queen sized air mattress for which I had purchased an air compressor that plugged into my cigarette lighter. (see? I thought of everything...except the darn flashlight). The first night we set up camp, ate ham sandwiches and had the very first campfire of my young son's life. Watching his joy around the fire, interacting with the other kids and just being happy and having fun without the aid of a computer or a Xbox, well, it was just a site that I will always treasure. He had his first Smore. "Oh MY GOSH, MOM!! I've waited my whole life to taste that and I think I just ate Heaven!!" We laughed until I cried. Mark has a night shift job and had a real hard time going to sleep that night. He had brought his laptop and luckily for him there was an electrical outlet up by the bathroom, so he hung out up there watching movies on his computer until 3 a.m.
5:30 turned out to be what time our camp leader had in mind for getting up because we all had to go to the Flag Raising Ceremony and we didn't want to miss it...at 8:30! In my house, we can be somewhere by 8:30 after only rolling out of bed at 8:15. These people apparently had to eat breakfast, shower, clean their tents, scrub and polish the great outdoors, and then sit around and wait another hour until it's time to go. 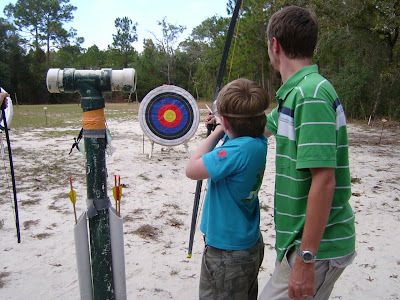 We have a lot to learn about the Cub Scout way of life. Mark, who was supposed to lead the Webelos around, had opted to skip breakfast, shower, and flag raising, thereby gaining several extra hours of sleep before the Round Robin schedule of events began. Smart boy. I went to the Flag Raising and came back to camp after having seen the flag raise. I planted myself in a fold up chair and let the rest of them split off into groups. They went off to basketball and softball games, and then all returned at lunchtime. 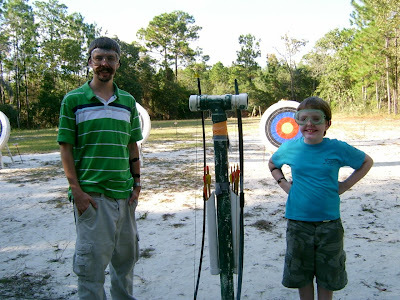 In the afternoon I decided I wanted to tag along because there was going to be target practice with bb guns and archery. Neither of these activities had Alix ever participated in before. He took so long getting his aim just right with the bb gun that my camera batteries died and the fresh ones were back at camp so I got no footage of that. We stayed Saturday but opted to leave that night after the Main Camp Fire Event where all the 200 campers gathered to perform skits. We wanted to stay for that because they also had a Flag Retirement Ceremony and it was the first time in my life I saw the American Flag burned and nobody got busted or was screaming or anything. Complete silence and total reverence. And I forgot the camera. It was packed up in the jeep by then. It was the most awesome sight. To see the red white and blue slowly sink into the flames until it was nothing but ash. It was like I was watching a funeral service or something. It was moving. We left before Smores that night. I just didn't have an ounce of strength left in me and wanted desperately to lay down on my pillow topped mattress. Having never known his mother to NOT have MS, Alix was very understanding. He didn't complain but was thankful for the time we had. Besides, he missed his computer and Xbox. So, I have accomplished yet another thing I thought I never would again. I had fun with my two sons in the woods. Priceless. This is such an amazing story that I just have to share it even tho it's not about MS, Fingolimod, or ME. John, my boyfriend and father of my child, has always been one of those guys who took his health totally for granted. He smokes, he drinks, and he hasn't let a vegetable pass his lips in years unless you count lettuce and tomato on a Wendy's double cheeseburger as a salad. A year or so ago he started noticing he had no energy. He also was out of work at the time due to this recession we're not having or the depression we're not in, one or the other. He's in the construction business and people just quit building houses all of a sudden. Probably a lucky thing for him because he didn't have the energy to get out of the recliner, let alone climb scaffolding. Then, in May of this year, his Dad passed away. He was in his 80's and had cancer, but had suffered several heart attacks before that. His brother who isn't that many years his senior has had his share of heart attacks as well. I think facing his Dad's mortality is what caused him to decided to see a doctor for practically the first time since I've known him. What he found out was astounding. He had super high blood pressure. I never did find out the exact number but it was 200something/100something. But that wasn't even the really disturbing part... he also has super high cholesterol. THAT number I will never forget: 1149. No, I didn't stutter on that "1", 1-1-4-9!! Doc gave him some blood pressure medicine and a nutrition sheet about good and bad foods for cholesterol-lowering. He said he would put him on meds for the cholesterol but couldn't because John was a heavy drinker, downing a gallon of rum per week along with countless six packs. He said "if you can get your drinking down to just 2 beers per day, then I can put you on medication. Until then, my hands are tied and you are a walking time bomb for a heart attack." When he told me all this, I was amazed myself that he hadn't yet keeled over. So, FINALLY he's been scared straight, so to speak, and is taking the fact that "you are what you eat" is more than a saying spouted by vegetarians and other "whole food eating, Mother Earth News reading hippies". Gee, maybe they were onto something, ya think? Over the next 3 months I witnessed a miracle. I have lived with this stubborn, set-in-his-ways man for 14 years, and never in my life would I have anticipated the change that came over him. God himself might as well have materialized on my couch and told me the end of this season's Survivor. I wouldn't have been more surprised. He quit eating red meat, he stopped eating starches, salt, eggs...well, just about everything he ever liked. He started scarfing down fruit and he gave up the rum. Completely. He went from 6 or 7 rum and cokes a night to zip, zilch, nada, nyete (now I'm just showing off). His fruit habit was darn near as costly as his booze habit used to be. The man could slay an entire watermelon and ingest it's offerings in a single (or two) sitting(s). Green grapes were also no match for the likes of him. He started eating tilapia with a vengence. I will conceded that the fish is fried, but it's fried in canola oil. He eats grits with them and uses "No Salt" salt substitute which, it turns out, is potassium, which can aid in lowering cholesterol. He uses Promise butter substitute, he drinks Juicy Juice fruit juice and he doesn't eat any processed foods. He's gone from eating only take out, (because he didn't want to eat the foreign stuff our son and I were ingesting, like broccoli -- blech!) to eating only his diet on that sheet he got from the doctor. Also, he got into my Centrum vitamins and started taking them, along with my Fish Oil pills. He was watching TV one night and paid attention to some ad for Fish Oil/Omega3/Plant Sterol pills that combined every good thing known to man into one mighty cholesterol vanquishing sword of a capsule. He whipped out his credit card and ordered them. A week later he got his 3 jars of pills, plus his one free one, plus his tiny sample of CoQ10 skin rejuvenating cream. I didn't interfere with his new regime. I just followed his wishes and fixed his meals according to his instructions. He went back to the doctor at his 3 month checkup. Mainly he did this because he ran out of blood pressure meds. When he asked me, "Can't I just call them up and he can call in another Rx for me?" I told him, "No. The doctor needs to see you to evaluate if this medicine is the right one for you, so you have to go see him again." "That's a crock of crap! They just want to get ya in there to drain you of your last buck and try to find something else wrong with you so they can keep bleeding you dry." I roll my eyes, knowing that he probably won't ever go back and all this has been for naught. He calls and makes an appointment. The day comes, he heads out the door and I pick myself off the floor from where I have fainted and wait for him to return from his visit. "You're not going to believe this!" he says, "My blood pressure was 130/80! That medicine he's got me on is working." I see a band aid on his inner arm and know they drew blood. "When will you find out about your lab work?" "The doc said he'd call when it comes back." Two days later we get the phone call. I listen to John's end of the conversation. "That's incredible! Can what I was doing really have had that much of an effect?..." "So, I don't need the meds even tho I quit drinking so I could take them?..." I couldn't WAIT for him to get off the phone. I darn near took it away from him so I could ask a bunch of questions like the professional patient that I am. John hasn't been sick a day in his life and knows not how to wheedle information out of a doctor. When he hangs up, he looks at me in utter amazement and says "Guess what my cholesterol is now. Just guess!" He says "Nope. Try 106." "So, the doc said I don't need the cholesterol meds and to just keep doing what I'm doing because it's working, whatever it is. He said it IS possible to make a change that drastic, but most people don't have the will power or self control to maintain the changes that consistently." He may have spared himself from his family's legacy of repeated heart attacks and bypasses. He still smokes, and he drinks his 2 beers a day, but between his son and I we're working on him about that. Oh, and his energy has returned! No longer does he kick back in the recliner straining to lift the remote. He's up and at 'em every day, if not working at construction jobs for pay, then working on the big construction job that is our home (in various stages of remodeling). I went on Thursday to my one month checkup of the extension phase and everything went great! I got an 8:30am eye appointment which meant she hadn't had time to get all backed up and leave me soaking in the dilating drops for a few hours. Instead, I was in and out fairly rapidly. At one point she had me look through the thing which covers up one eye while you look through a hole with the other eye. She held a white card with a black thin-lined grid on it that had a dot in the center. Staring at the dot, I was to tell her if the lines looked wavy or anything. "They are all double" I said. "Blink a few times and tell me again." she said. "Yep, they're still all double." She whips out a bottle of drops and squirts some yellow fluid in my eyes. After I wipe the overflow off my cheeks with a tissue, she has me put my head in the vice thing (not really, but it sort of *holds* your head) while she shined a bright blue light in them. "You have dry eyes that look like it's due to allergies. Do your eyes itch a lot?" she asks. "Well, not until right now that you mention it. I want to rub them pretty badly." I squirmed in my chair. It was like how my nose itches whenever I fully submerse my hands in dish water. "It's nothing. Just get yourself some eye drops and use them 3-4 times a day. That ought to help." So I leave there and go to see my trial coordinator. I get blood drawn, get weighed, and have temp and blood pressure and pulse taken. Then they send me off to have my Pulmonary Function Test. I check in early and sit to wait. They guy who always does my PFT stuck his head in the waiting room and said "We'll be right with you, Jeri." I say okay and thumb through a copy of AARP's magazine but I have no clue what it's about since my eyes are still dilated so I just look at the fuzzy pictures. Some younger guy comes to get me and I swear his voice cracked as if he were entering puberty. "Come with me," he croaked. "Did you just come from the eye doctor?" he says as he checks out my paper sunglasses. "Oh, no," I tell him, "I got these last time I was here and I just love the look." He gave me a weird look and a wider birth. "Yes, I just came from the eye doctor, so you can screw up all you want because I can't see what you look like or read your name tag so it's cool." He said he was new at this and I asked where the other guy went. He said he was training him and he's "around if I need him." NOTE:Image may not be representative of actual testing device OR actual patient. This is only a reenactment. We went through most of the tests fairly rapidly. Then we got to the one where they use the extension contraption that I have to breath through that consists of a hookah like pipe with a hose connected to the end of it and a hole that I have to periodically cover/uncover with my finger on cue. Turns out the important phrase in the last sentence is "on cue". The guy didn't know how to give me the instructions and *cue* me just right so between the two of us we kept screwing up. I ended up wearing out the cardboard disposable mouthpiece (for my safety) and was given a new one. Midway through this test he is looking at some of the results and says that my lower lung volume is below the normal range and he's going to have to give me a shot of albuterol. Fortunately, a "shot" to him consisted of putting the inhaler in my mouth and depressing the canister to administer a does of stuff to inhale. No needles anywhere to be seen. Whew. I was all panicky thinking of having to have the stuff because my son has asthma and uses a nebulizer which has a face mask and a mini air compressor that vaporizes the Albuterol so he can inhale it. It "makes his legs noodly" according to him. I've seen him get the shakes so I know just what he's talking about. Of course I braced myself. I did the test again and scored a 90 where I had scored a 70 previously, so apparently it worked. So I go back over to the research department and find out that another guinea pig, um, I mean patient, from my trial is there getting poked and prodded. I never did get to see him but I did hear his voice. Sounded like a nice guy and had the CUTEST baby girl with him ever. She was probably about a year or so old and just a dumpling. I got to meet her because since Daddy was getting blood drawn, the doc took the baby on visiting rounds up and down the hallway so she wouldn't witness the trauma. All in all it was a quick visit and I stopped to get eye drops on the way home. Turns out I'm more of a sissy about eye drops than I ever was about doing shots. I can cram a 2" needle buried up to the hilt in my thigh, but quivered with sheer terror holding that eye drop bottle above my face. Guess that's a dead give away that I don't wear contacts, huh? The drops made them quit itching all right...they burned too bad to itch. Nice idea, doc. Thanks for that. Anyhoo, I'm feeling great. So great that I went on the Zoofari Cub Scout trip to the Jacksonville Zoo with my son yesterday. Something I would never in a billion gazillion years do in the previous 10 years. I had a great time and kept up with everyone, didn't need a cane or chair and only rested when everyone else did. Of course today I spent mostly in the recliner lifting nothing heavier than my remote, but I'm sensing that it's from old age and not MS that I'm sore today. I'd like to blame every ache and pain on MS, but the truth is I'm not 16 any more. Honest! I know you can't believe that looking at my picture, but I'm not.